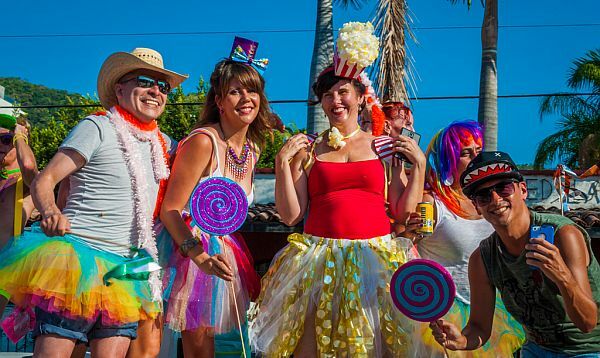 Vallarta Pride rolls out for the first big event of Spring and it's become a grand affair in recent years. Many of the city's Pride events are not just for the LGBTQ crowd; they are for everyone and all are welcome. Puerto Vallarta, Mexico - 'High season' was officially over as of Easter Sunday, April 1st, but that doesn't mean things slow down in Puerto Vallarta. Pride week rolls out for the first big event of Spring and it's become a grand affair in recent years, with an entire week devoted to the cause. Commencing at the same time (7 pm, Monday, May 21st) will be the Opening of the International Film Festival on the Main Stage at ACT II Entertainment. Part of the famous Guadalajara Film Festival, this year's theme is "One Hundred Reasons to Celebrate." Puerto Vallarta will join in two worldwide events during Pride Week, with the International March Against Homophobia taking place on May 17th. Everyone is welcome to participate and a huge turnout is expected. This march will commence at the Hotel Sheraton at the north end of the Malecón from 6–8 pm and wind up at Los Arcos, with further festivities. The second march will be by candlelight; the International Sunset Memorial Candlelight March will begin on Sunday, May 20th at 8 pm at the Hotel Rosita and also be completed at Los Arcos. This is a SETAC-sponsored event to remember those who have lost their lives to AIDS. We highly recommend using public transportation on these evenings. Many Banderas Bay area markets are still open as well throughout May, with some staying open all through 'low season.' We recommending asking your favorite vendors at these markets what their summer plans are, since many sell year around. Pro tennis is back, and we're super excited to follow this global tour that hits Puerto Vallarta on April 30 and continues through May 5th. Part of the ATP (Association of Tennis Professionals) Challenger Tour, the Puerto Vallarta Open will be held at Parota Park. There's no reason to be bored in 'low season,' and we're off to a great start!